IC	Relief. Mould imparted directly above left and right sides of heel. Stem bore size: 8/64ths. Identified as Scottish pipemaker James Colquhon (1668-1700). Refer to Sharp 1984:36. 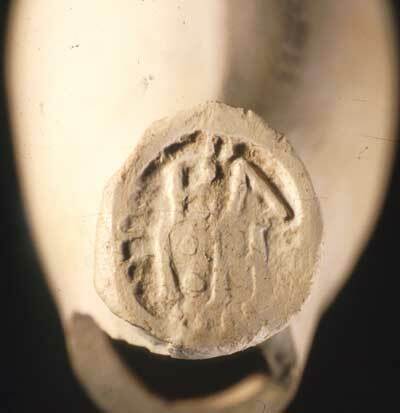 Exact bowl and mark found in a pre-1690 context (Martin 1987:227). IT	Relief. Stamped on heel. Stem bore size: 5/64ths. Dutch pipe bowl manufactured in Gouda and dating 1680-1710. Possibly Gouda pipemaker Jacob Thoniszn (1670). See Duco 1981:326. IT mark also in Duco 1982:84 with dates 1695/1705-1710/1715. Crown over bunch of grapes relief. Stamped on heel. Stem bore size: 6/64ths. 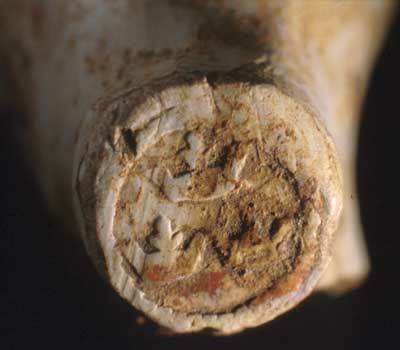 Fragmentary pipe bowl but the mark is Dutch and seen in pipes from Gouda dating 1680- 1710. Refer to Duco 1981:465. 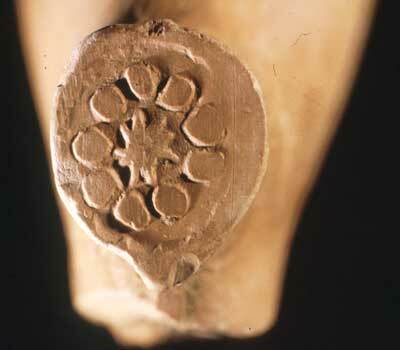 Exact mark found in Duco 1982:49, but no date. Three Crowns Relief. Stamped on heel. Stem bore size: 5/64ths. Fragmentary pipe bowl, but both bowl and mark appear to be late 17th or early 18th century Dutch, likely made in Gouda. Gullov and Kapel (1979:143) show the 3 crowns as the mark of Kobus Witsius (pre-1728). Duco 1982:60 dates the three crowns 1680/85-1789. Cannon	Relief. Stamped on heel. Stem bore size: 6/64ths. Fragment consists of stem and heel only. 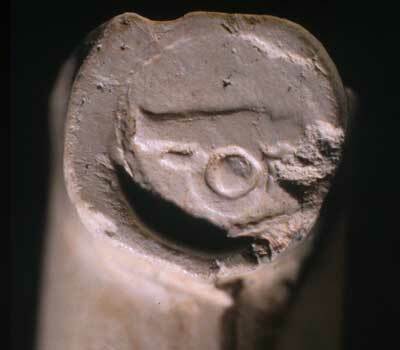 Cannon mark was likely manufactured in Gouda. Duco 1982:66 dates this Gouda mark 1687-1747/1751. IP Incuse. Stamped on heel. Stem bore size: 7/64ths. 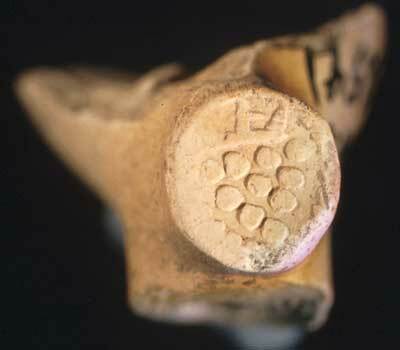 Pipe bowl fragmentary but appears to date from the late 17th century. Numerous IP makers from both London and Bristol from this period. BA/RVM Incuse. Stamped on heel. Latin abbreviation of Barnstaple. Stem bore size: 7/64ths. Both pipe bowl and mark attributed to Barnstaple, Devon manufacture, likely by a group of pipemakers. The actual mark of BARVM differs and there are up to 4 different stamps identified. 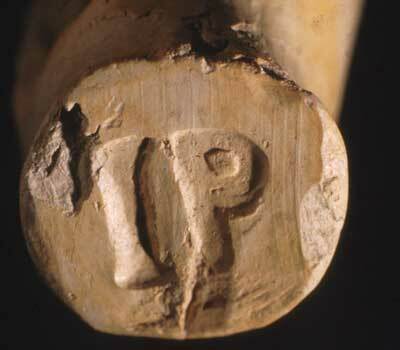 Pipe bowl shapes with these marks date from 1660-1740. Refer to Grant and Jemmett 1985:451. WP Incuse. Stamped on heel. Stem bore size: 7/64ths. West Country or Bristol pipe bowl style, late 17th century. Could be William Phillips of Bristol (app. 1674 f.1689-90) Refer to Walker 1977:1245. 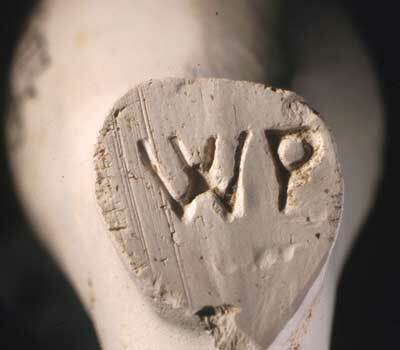 Also, Barnstaple pipemaker William Price (1660's-1670's) Refer to Grant and Jemmett 1985. RT Incuse. Stamped on back of bowl facing the smoker. Stem bore size: 6/64ths. Both pipe bowl and mark attributed to Robert Tippett II, Bristol pipemaker (1678-1713 poss. to 1720). Refer to Walker 1977:1493. Star with pearled border Relief. Stamped on heel. Stem bore size: 6/64ths. 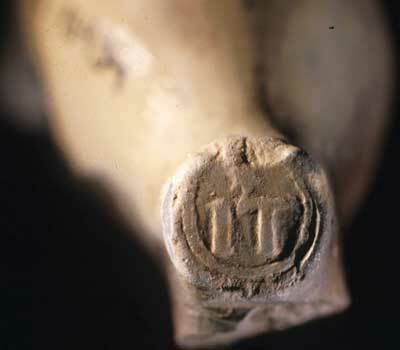 Appears to be a Dutch mark and was found at Ferryland in a late 17th century context. Refer to Oswald 1969:141 for a similar styled Dutch makers' mark. PA/IH Relief. Stamped on heel. 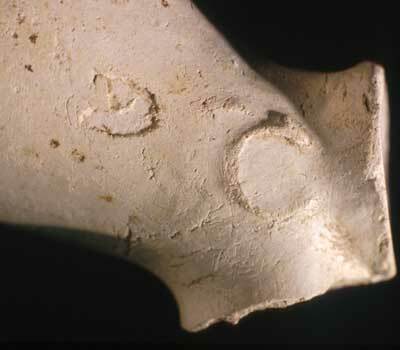 Fragmentary pipe bowl, stem bore measurement not possible. 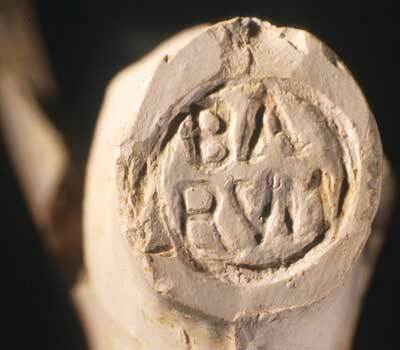 Pipe bowl and mark attributed to Barnstaple, Devon. Bowl form dates from 1680-1720. 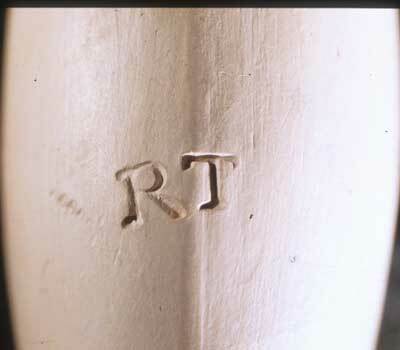 Could be mark of John Horwood, free in 1713. Refer to Grant and Jemmett 1985:452; 513.